Governor Andrew M. Cuomo today announced 13 transformative projects as part of the ROC the Riverway initiative to revitalize the underutilized area along the Genesee River in Downtown Rochester. The projects came at the recommendation of the appointed ROC the Riverway advisory panel, which created a new Vision Plan to prioritize the transformation of the area through targeted public and private investments. The advisory panel was created in February of this year as part of the Governor's announcement of $50 million in state support for the initiative. 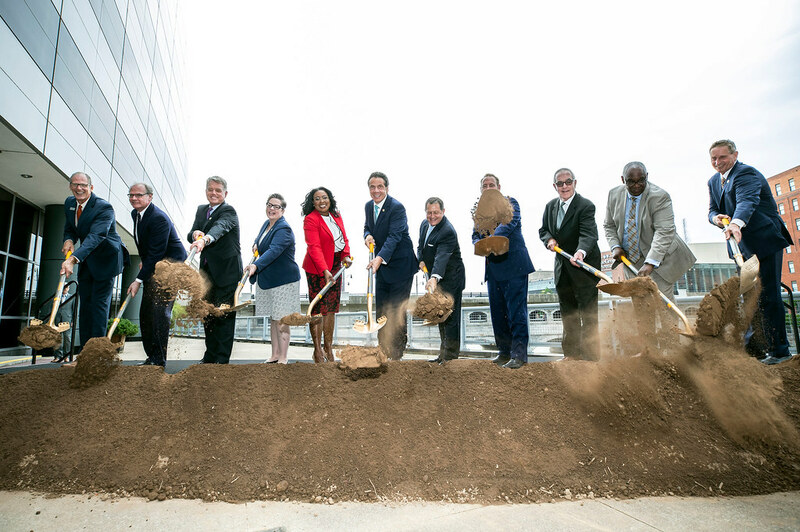 "ROC the Riverway is a critical initiative poised to tap into the potential of downtown Rochester's Genesee River waterfront," Governor Cuomo said. "This plan will not only drive tourism and spur economic investment, but it will also encourage investment and help keep the Finger Lakes moving forward for generations to come." The panel, led by Finger Lakes Regional Economic Development Council Co-Chairs Monroe Community College President Anne Kress and Rochester Chamber of Commerce President and CEO Bob Duffy, launched a multi-faceted effort to create a comprehensive plan to revitalize the riverfront. These efforts included soliciting input from the community and from area stakeholders, and focused on projects that will promote the health and vitality of the river, focus on area connectivity, public art and education, and protecting environmental, cultural, historic and natural resources in the area. The advisory then used their findings to outline recommendations for the Governor's approval. The ROC the Riverway initiative will also support the city's newly updated Local Waterfront Revitalization Program plan which aims to attract millennials, enhance recreational opportunities, and drive growth along the waterfront. "Significant investments in Rochester are helping to build the city, and projects as part of 'ROC the Riverway' will propel that transformation to new levels," said Lieutenant Governor Kathy Hochul. "New York is proud to partner with communities like Rochester and implement plans for revitalization to benefit residents and grow the economy. Enhancing the area along the river in downtown will create new opportunities and further advance the Finger Lakes Forward strategy to revive the area." Aqueduct Re-Imagined ($4.5 million) - This project will create a commitment to remove the Broad Street bridge top, with funding dedicated to complete final design, including of new riverway segments on both sides of the Aqueduct from Court Street to Main Street. Rundel Library North Terrace ($1.5 million) - The North Terrace has been closed due to structural issues and has created a public safety issue. Funding will make necessary repairs to reopen the North Terrace for outdoor library rooms, café spaces and programming opportunities. Blue Cross Arena ($6 million) - This funding will create an exterior river terrace, opening up views to the river from within the arena, along with other major renovations to the arena's dated infrastructure. Today marks the first day that the arena is under the management of Pegula Sports and Entertainment, which recently entered into a temporary agreement with the City of Rochester to operate the venue. Convention Center ($5 million) - Funding will continue needed renovations to attract more competitive convention and other business, by building upon past renovations to the escalator system and river terrace with a renewed focus on connecting the facility to the riverfront. Riverway Main to Andrews ($20 million) - Funding will renovate Charles Carroll Park, Crossroads Garage, Crossroads Park and the Sister Cities Pedestrian Bridge, significantly enhancing connectivity for non-motorized modes of transportation on both sides of the river from Main Street to Andrews Street. Front Street Promenade ($1.25 million) - Funding will be used to build a promenade along the river from Andrews Street to the Inner Loop. This, combined with a proposed mixed use development on Front Street, will build upon existing and future investments in the area. ROC City Skate Park ($1 million) - A new public skate park will be built under the I-490 Douglass-Anthony Bridge with direct access to the Riverway Trail and adjoining the Downtown and South Wedge neighborhoods. The City of Rochester also just received word that it has been awarded a "Built to Play" Grant for $250,000 for the project from the Tony Hawk Foundation. Genesee Gateway Park ($2 million) - Funding will improve the existing Genesee Riverway Trail by expanding park river access to the South Wedge neighborhood, building upon existing development projects along Mt. Hope Avenue and the South Wedge. Corn Hill Navigation ($250,000) - Corn Hill Navigation operates tour boats on sections of the Erie Canal. Funds will provide additional resources for a new boat to generate activity in the South River area. High Falls Terrace Park / Brewery Line Trail ($1 million) - One of the City's oldest parks, High Falls Terrace Park has not been used to its maximum capacity. Funds will create a new trail, the Brewery Trail Line, which will be located along the park and near the Genesee Brewery, connecting and further serving the area. Funds will also be used to upgrade the existing park and trails, creating access to and views of High Falls. Pont de Rennes Bridge ($4 million) - Funding will make needed structural repairs to the existing bridge, funding design and construction of improvements to the bridge. Running Track Bridge ($500,000) - The Running Track Bridge is a former rail bridge that is currently abandoned. Funding will modernize the bridge for future phases to link pedestrian access between neighborhoods including El Camino, Edgerton and High Falls. ROC the Riverway is a critical initiative poised to tap into the potential of downtown Rochester's Genesee River waterfront. Empire State Development President, CEO & Commissioner Howard Zemsky said, "Renewed access to the Genesee River is part of ROC the Riverway's strategy for a revitalized downtown Rochester, with the city's natural assets creating a ripple effect that will draw visitors and businesses and boost the local economy." Finger Lakes REDC Co-Chairs, Monroe Community College President Anne Kress and Rochester Chamber of Commerce President & CEO Bob Duffy, said, "We would like to thank everyone who took part in the amazing process. This was truly a collaborative effort as the advisory panel worked together with the community and with regional stakeholders to put together a plan which we believe is a solid way forward for the transformative "ROC the Riverway" plan. This initiative will continue to build on the magnificent transformation that is already happening in Rochester's new Downtown Innovation Zone, which is helping to create an exciting environment where people, young and old, want to live, work and play." Rochester Mayor Lovely A. Warren said, "Thanks to the vision of Governor Andrew Cuomo, whose initial $50 million investment through Empire State Development's Finger Lakes Forward initiative set the Roc the Riverway project in motion, our city will finally realize the full job-creating, community-building potential of the Genesee River. I also want to thank the Roc the Riverway Advisory Board and the hundreds of engaged citizens who participated in our community input process for all their great work to produce this Vision Plan. This is an exciting time for Rochester, as we are about to witness an unprecedented level of investment and activity along our riverfront, which will help us transform our city and create more jobs, safer and more vibrant neighborhoods and better educational opportunities for our citizens." Assembly Majority Leader Joseph D. Morelle said, "Our community's history is deeply connected to the riverway and so too is our future. By reimagining and redeveloping Rochester's waterfront we will realize the full economic potential of the Genesee River, enhance quality of life and recreation opportunities for residents and visitors all while continuing to protect and celebrate a vital environmental asset." Senator Joe Robach said, "This $50 million investment by New York State, in the twelve projects chosen by the advisory panel, will go a long way to revitalizing the Downtown-Genesee River corridor and will make critically important infrastructure and quality of life improvements for the people of our community. I am happy to support the efforts of Mayor Warren and the City Council to highlight the beauty of the Genesee River and increase accessibility through "ROC The Riverway." Senator Rich Funke said, "The potential of the Rochester region is starting to shine through as we make headway on 'Roc the Riverway.' As chair of the New York State Senate Committee on Cultural Affairs, Tourism, Parks and Recreation, I will continue to support initiatives that focus on increasing the number of visitors to our region. I'm pleased to see this initiative taking into account the wishes of the local community." Assemblymember Harry Bronson said, "The Genesee River has historic and economic significance and investing in this revitalization project will boost our local economy. Under the leadership of Bob Duffy, Ann Kress and the commitment of the Advisory Panel the 'ROC the Riverway, will establish the Genesee River as the focal point of our downtown community and support the city's updated Local Waterfront Revitalization Program. This exciting and diverse team will allow local government and businesses to work together to draw more visitors' downtown throughout the year and bring the best in recreational, educational and business activities to the heart of our community."